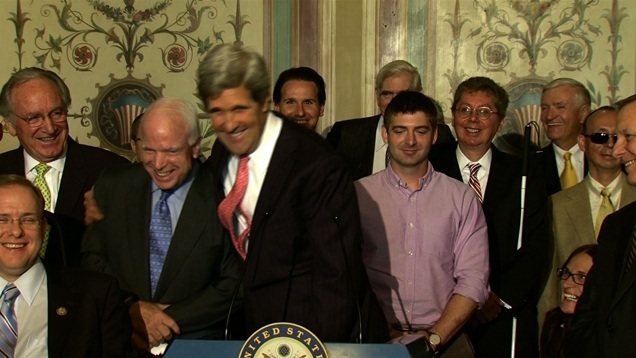 In the video above, John McCain (R-AZ) jokes with the audience and his colleague from across the aisle, John Kerry (D-MA) while calling the Massachusetts Senator, "Mr. Secretary" - alluding to the well-known speculation that Kerry has been for some time, on President Obama's short-list to replace Hillary Clinton as Secretary of State - although he is probably not Barack's first choice. The recent controversy regarding Susan Rice has made Kerry's nomination for this post somewhat more likely. Some have suggested that the republican attacks on Ms. Rice have the ulterior motive of vacating Kerry's U.S. senate seat for a potential republican spot in a special election, should Rice's nomination not pass the Senate - and Kerry is nominated and approved instead. Chess on the Senate floor. Significant body language tells are displayed in this segment - with several different underlying emotions. Just after Senator McCain springs his joke, Senator Kerry rubs his lower forehead/upper brow and to briefly covers both eyes. This nonverbal indicates emotional processing, and a wanting to "wipe it from his mind" - he is saying to himself, "I can't believe he just said that". Very shortly after the above noted bilateral display, Senator Kerry rubs his left eye only. This body language of a unilateral eye rub indicates that, after the initial surprise, Kerry believes that there was something deceptive transpiring. As suggested above, he is most probably questioning Senator McCain's motives. In the real world, emotions rarely occur in isolation and they also happen in rapid sequence. After Kerry says, "See, this is what happens when you get two losers up here", while their laughter and smile are sincere, Kerry's evanescent grabbing and shaking of the back of McCain's head/upper neck (just prior to one-armed hug) indicates more than a hint of a reprimand and scolding and is also an alpha display.